Email has changed the way we communicate with our friends, employees, co-workers, relatives, etc. The first thing that 90 to 95 percent of internet users do after waking up in the morning or entering their office is they check emails. Social networking apps and websites have over 1 billion users combined. They allow you to share videos or pictures with other users within 50 to 10 seconds. Although social networks are doing pretty well, they cannot replace email clients and services. Email is one of the most important internet services. Millions of sites depend on it. Example: Many websites running on the internet ask users to verify their email accounts. If you don’t use an email service, the site will not permit your account. When Nokia was a popular company, people had to rely on websites and browsers to check their inbox or send a new message to other users. Now, things have changed. Android OS has made our lives easier. The operating system’s brilliant architecture makes us less dependent on web browsers. We can use our favorite services without a browser by downloading an app. The same thing applies to emails. 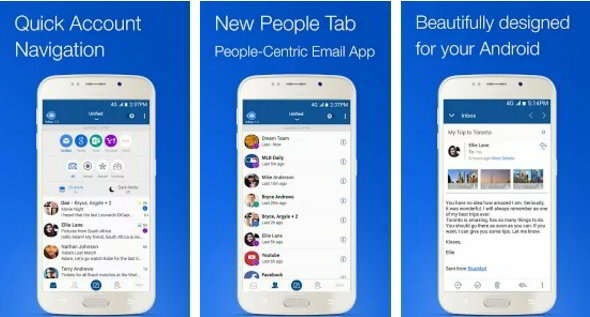 Several companies have launched email client apps for Android phones and tablets. Hence, we don’t have to use the browser to open Gmail, Outlook, or any other site. Although you’ll find 100s of email applications on the Play Store, only the below apps among the lot provides a great experience to the users. 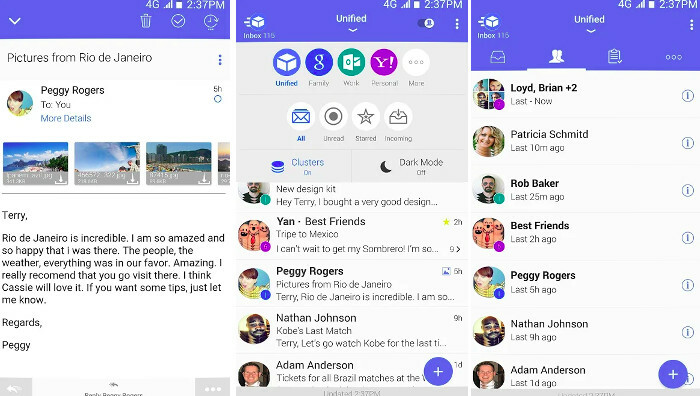 Inbox for Android is an email client app that was launched by the search engine giant Google. The app’s size on the Google Play Store is 12.9 megabytes. After installation, it consumes 15+ megabytes of storage memory. When you run it for the 1st time, the inbox app shows a beautiful slideshow with five slides and a skip button to open the main interface. If you are a first time user, go through the slides one by one. Once you reach the last slide, you’ll see the “Done” button and several toggle buttons. Enable the toggle options of your choice and then tap on “Done”. 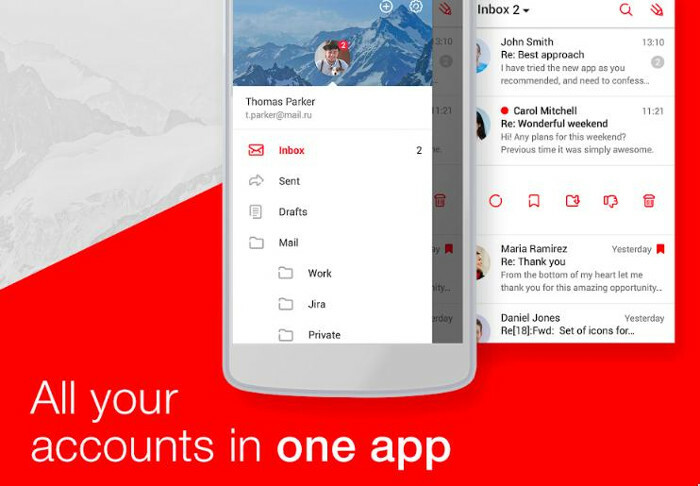 If you have set up an email account for your Android phone/tablet, the Inbox app will automatically detect and fetch new emails from your account. 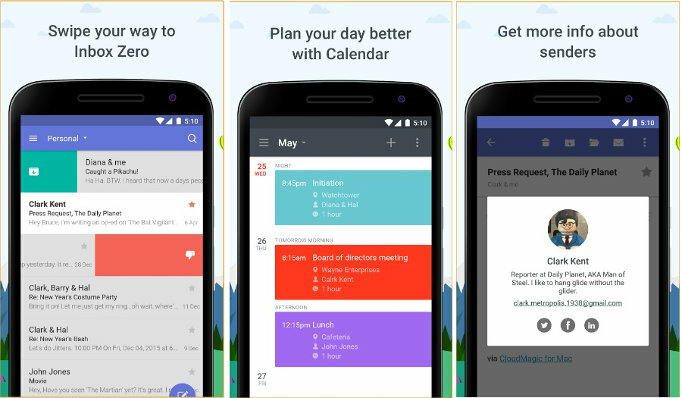 Apart from being a good email app for Android, Inbox lets you set a reminder to call someone, send email, text message, participate in a meeting, read messages, edit files saved on Google Drive, make reservations, etc. It also lets you pin important messages so that you can access them quickly. Inbox has a search option and it allows you to compose new messages quickly. Note: Google has announced that it will discontinue the Inbox app/service next year. Instead of Inbox, you should download and use Gmail. The Google mail app now supports third-party email services such as Outlook, Hotmail, Live, Yahoo, etc. 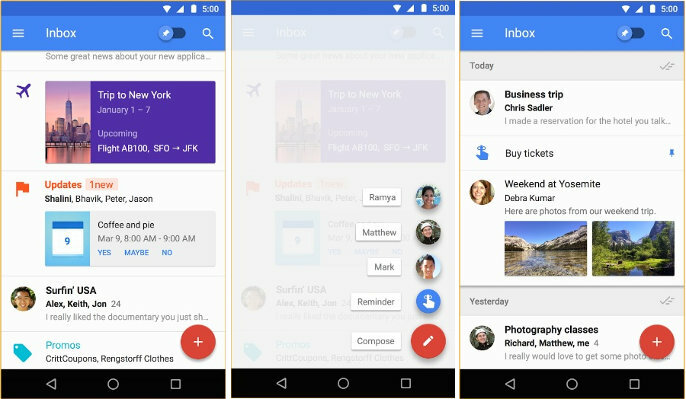 Gmail comes pre-installed on Android phones. Update the app to the latest version to enjoy its new features. MyMail is similar to Google Inbox and Outlook. It is a lightweight email client application that supports Google, Yahoo, Microsoft Outlook, AOL, QQ, and many other email services. The app displays the number of unread emails and an option to mark the mail as read/spam on its top bar. It provides several filters. It is one of the few apps that can display only those emails that have an attachment. MyMail saves a copy of emails on the phone’ storage memory. Hence, you can go through your emails even when the phone is not connected to the internet. Users can configure MM to download attachments or load images in emails only when a WiFi connection is active on the phone. By default, MyMail will play a sound when there’s a new email. It will also display a notification. You can change the sound/notification settings in the MM application. MyMail can automatically add your email address in the BCC field when you compose a new mail. It allows users to create a signature and filters that will automatically move emails from specific addresses to a specific folder. MM displays ads on its menu. You can turn off the advertisements from its settings interface. Have you tried TypeApp? If not, then try it out. TypeApp is a top-rated Android email app which supports multiple email services. The size of the app’s APK file is 46 megabytes. TypeApp is easy to configure. It has an Android messenger like interface that displays emails from different accounts in one interface. Hence, composing and sending new emails is a piece of cake. TA can insert signature and logo in new emails automatically. To use this feature, you’ll have to choose/upload a logo and set a signature. You can customize the menu and enable LED/push notifications in this application. You can also pair the app with a nearby printer to print an email. Like the My Mail application, TypeApp saves a copy of emails to the ROM. It supports the dark theme. AOL, Mail.RU, Sina, 163 mail. iCloud, QQ, Office 365, AOL. First-time users will see a list of the above email providers when they start the TypeApp app. Users must select the service they use after which they must enter their login credentials to begin using the app. TA has a good user interface. It is fast and easy to use. MailTime is a powerful Android email app but it has a single drawback that it doesn’t compile messages from different service providers in a single list. If you own multiple email accounts, you will have to visit inboxes one by one to read emails. If you hate doing this, try out the Cloudmagic app. CM app has an excellent rating and millions of daily users. It is a complex application which makes things easier for you. CloudMagic displays email from services it supports in one dashboard. Hence, it saves time. Like other apps we’ve covered on this list, CM supports Android push notifications. Apart from sending and reading emails, CloudMagic allows you to link important messages to apps like ZenDesk, OneNote, Wunderlist, etc. This app lets users archive and delete emails. It also allows them to mark an email as read. 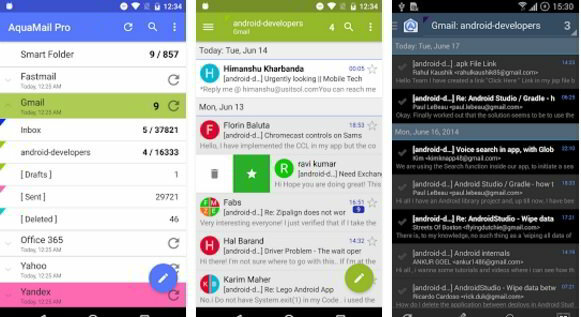 With an excellent rating of 4.7, BlueMail is one of the best Android email apps on our list. The developers have designed this app to support unlimited email accounts from various popular service providers. When you will use it, BM will remind you of Gmail because the UI of the two applications is identical. BlueMail is a great alternative to MS Outlook and Gmail. It supports POP3, IMAP, Microsoft Exchange, and many other services. This app provides a unified interface where it displays emails from various services. BlueMail lets you configure rich text signatures. It has the option to print emails. It features quick filters to find read/unread emails. The app lets you customize swipe gestures, switch to the dark theme, and add widgets to the home screen. It packs a smart conversations module and supports the GroupMail feature. Its APK size is 26.3 megabytes. BM is powered by a strong encryption algorithm. You can configure it to lock the phone after a specific time period. Select the service type of your choice and then tap the “OK” button. Now, follow the onscreen instructions. AM is compatible with Android wear and supports widgets, swipe gestures, integration with light flow/tasker, and many other best Android launcher apps. Other widely used apps are Gmail and Microsoft Outlook. Conclusion: The best Android email apps and clients we have mentioned above are secure. They are widely trusted and used by Android lovers. The applications provide excellent features. They are free. Are you using any one of them? Bluemail truly is a frustrating email app that should be avoided. That is why I’m here looking for a replacement. This review about BM is way off. Frustrating SLOW searches, ‘drafts’ not working right, dropping sent emails with attachments. Forget this ‘BM’! Cloud Magic is now Newton and it is free to use, but if you need push notifications, you need to buy the app subscription $50/year. It is important to note that Inbox by Gmail only support Gmail accounts unlike other mail apps (e.g. GMail). Sad, as it is a great mail app – I like the interface but have other non-Google email accounts so not usable for me. Thought by now they would have added the ability to add non-Google accounts but no go.